In its objection to the proposed Rocks Green supermarket, the Midcounties Co-op (which trades at Harry Tuffins) says that there is no case for a new store (14/05573/OUT). If the 25,000 sq ft store was built, it would create more damage to trading and tourism in Ludlow than the supermarket’s proponents are suggesting. Only 40 full time equivalent new jobs will be created, the Co-op claims, not around 90 as suggested by the developer’s consultants, Indigo Planning. There is no requirement for a new supermarket in this location either on a quantative or qualitative basis as there is insufficient expenditure for a store of this size. Consequently, if the proposal went ahead it is inevitable that it would draw trade from the town centre to the detriment of its vitality and viability. The Co-op criticises the scheme for being led by property developers not by a named a retailer. It criticises the way the sequential test was conducted – this is a required test that insists that developers look for town centre first, edge of centre sites second and out of town sites only as a last resort. It says that the retail turnover of the proposed scheme has been underestimated and there is potential for the store to increase its sale area unless this is specifically restricted by planning permission. Not enough allowance has been made for the impact of growth of internet shopping or the proposed Tesco at Tenbury. The amount of money visitors to Ludlow currently spend in Aldi and Tesco has been overestimated. The Co-op says Indigo Planning also has incorrectly classified Tesco as out of centre (a point I have made previously). It is clear that the Tesco and Aldi are trading well but shops cannot trade at twice the company average without obvious signs, including crowded aisles, the frequent restocking of shelves or items not available on the shelves, frequent and excessive queuing at checkouts, and difficulty in finding parking spaces. These problems are not frequently experienced in Ludlow outside peak shopping times. The Co-op says that Indigo Planning should publish the detailed results of the consumer survey which the developers say supports the case for a new store. It says there is no information on when and where the small on-street survey of 100 people was conducted. Results would be different on market and non-market days and in different weathers. The Co-op complains the study area used for the survey of 1,000 consumers was too large and again it wants the full details published. It is inevitable that if a new store was permitted on the eastern side of the A49 there would be little or no pedestrian linkage and this would affect footfall in the town centre. The convenience goods town centre turnover is estimated by Indigo as being £11.31m in 2019, but this mistakenly treats the Tesco as out-of-centre. Including the Tesco store it is estimated at £33.79m and the impact would be 23.6%. This compares with the 6% estimated by Indigo. The Co-op also complains Indigo Planning have underestimated how much trade in comparison goods would be diverted from the town centre. Indigo Planning suggests an overall gain of 93 full time equivalent jobs if the scheme were built. The Co-op disagrees and says the net new employment is more likely to be around 40 rather than around 90 FTE. The town centre has a strong mix of independent traders whose trade would be diminished by a further supermarket of the size proposed. This would harm the character of the town and potentially affect its attraction as a centre for tourism. It is quite clear… that the impact on the town centre would be significantly adverse and planning permission should therefore be refused in accordance with paragraph 27 of the NPPF and policy CS15 of the Core Strategy. The proposal would have some employment benefits, but these would not be sufficient to outweigh the harm to the town centre. Councillor Vivienne Parry has also submitted an objection to the proposal. She says the scheme is too large for the site. The entrance to the location is dangerous and queuing traffic will hinder access to the Rocks Green housing. The scheme will block the fine view that residents currently enjoy and will create light pollution. Councillor Parry suggests that proposed store on Coronation Avenue would be a better location for a petrol filling station. Did Indigo Development agree that Aldi was an In Town supermarket? If so their claim that Teso’s opposite is out of town is clearly ludicrous. Surely on this basis alone the planning should be refused? As the Co op says, this is a speculative developer led proposal, with no named retailer, which flies in the face of current shopping trends towards Internet and more local in-town shopping habits. Trends that are seeing the closure of supermarkets. No. Indigo Planning said Aldi is out of town. In my book, and that of the Co-op’s consultant Aldi is edge of centre. Indigo believe that the town centre for retail planning purposes is defined by the primary shopping area – basically King Street to the market. This is why they say Tesco and Aldi are out of town. 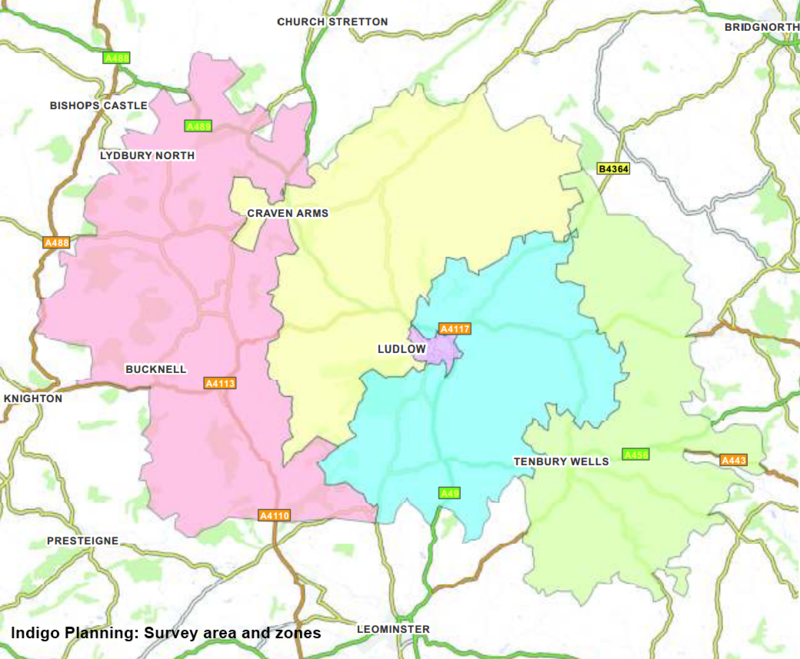 The National Planning Policy Framework clearly says the town centre is defined by the proposals map (SAMDev and the saved South Shropshire Plan). This is likely to be a major issue in assessing this planning application as definitions of town centre, edge of centre, out of centre and out of town are essential in interpreting planning policy. But in some ways the argument is irrelevant to understanding the impact of the supermarket. More than half of the customers to Tesco and Aldi make “linked trips” to other retail outlets while doing their main shop at the supermarkets. Indigo are suggesting this will not fall if an out of town store is built. As the Co-op says, that can’t be right. We are the new group leaders of the Ludlow U3A Food & Farming Group which numbers about 30 members in total, with attendance at our monthly meetings around the 15-25 mark. In April our meeting is due to be held on Thursday 9th, at the Guy Thorneycroft Centre just off Parys Road, Ludlow, and we are having a discussion on the proposed new Supermarket plan at Rocks Green. Our meeting starts at 10.00 a.m. and we usually break for coffee and tea around 11.00 a.m.
We wondered whether you would have the time to come and give us some input/background as to how far the application has gone – and what, if any, influence the thoughts of local people might have on the outcome. We think that if we leave this discussion any longer than April, the decision may well have already been taken by the powers that be. I believe that John Farley (who is also a member of our group) has tried to telephone you on this matter, but not sure if he left you a message/contact number. If you are unavailable, perhaps you could direct us to Viv Parry as I think that Rocks Green is part of her patch. We would be very grateful if you could let me know if you would be able to help us at all.